If you like a bit of retro on your bingo site, then do we at Place a Bet Online have the perfect place for you. With a 1950’s classic American look, Bingo Extra offers lots of bonuses and plenty of games. They claim to be more like the good old days ‘when life was simpler and you got more bang for your buck’; anything where we get bonus gaming is great for us! When it comes to games you’ve got so much to choose from, you’ll be in heaven! There are over 100 instant games, table games, roulette games and slots such as Starburst and Cutie Fruits. Our favourite game bingo is available as 90 Ball, 75 Ball, 5 Line Bingo and Pre Buy rooms, plus there’s even funded rooms if the pennies are a little tight! It may look like a golden oldie but Bingo Extra know how to use their technology, because they’re available on desktop, mobile and tablet devices. This will make playing such a huge range of games much easier and you can eradicate those boring parts of the day, with a featured slot game. •	Available on Facebook, Twitter and Google+. 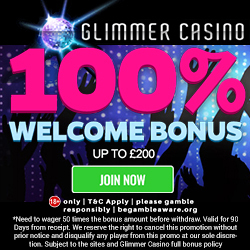 100% cash match bonus on 1st deposit, add £10 and play with £20 on slots games. 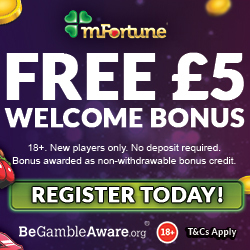 We love this bonus because it suits everyone, whether your preference is slots or bingo! 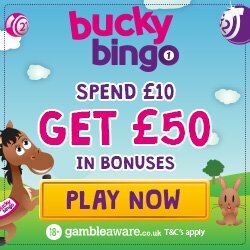 Deposit between £30 and £200, you’ll receive 50% bingo bonus. This means that whether you’re winning or losing, you’ll still earn a little something extra. Make sure you select the bonus when you make your deposit and any funds will be added instantly to your account. Bingo Progressive Jackpots – Win big without spending a penny! This game runs alongside their normal bingo games, so if you have 6 or more cards you could be in with the chance of winning. Win-Win Wednesday – Join Bingo Extra every Wednesday and if you don’t win a part of the available jackpot, then you’ll get your money back. Weekly Shop – With the price of everything going up, shopping can become an expensive chore. Join Bingo Extra in their Weekly Shop promotion and you could win £100 Asda vouchers. 10k Slider – On the last Friday of every month head over to the Slider game where you will have 5 chances to win up to £10,000. If you love keeping up on the latest Bingo Extra news, then make sure you check out their community section. The have a chat news section, a blog on current bingo news and events; plus stories of their many winners. Most of us enjoy making new bingo roomies/friends as we game, so make sure you check out the chat rooms. They have friendly chat moderators who explain each of the games and prizes, so who knows who you could meet. As a thank you for being with Bingo Extra, you’ll receive EXTRA loyalty points simply for playing. So as well as enjoying their great games, you’ll be earning points which will lead to bigger rewards. Once you have a minimum of 1,000 points, you can convert them into additional bonus money to use on even more gaming! That’s right there’s even a VIP Scheme to reward the Bingo Extra regulars. There is 5 levels to the scheme including bronze, silver, gold, ruby and emerald, with some of them being accessible on an invitation only basis. To move through the levels you have to reach a certain criteria, so the more you play the higher the level and the more benefits available. Each level has a unique set of benefits, but some of these include higher redeposit bonuses, daily bonus spins and cards, a Birthday bonus and a dedicated VIP Manager. You’ve probably realised that Bingo Extra are a sociable bunch, so it won’t surprise you that they have pages on Facebook, Twitter and Google+. So if you like to keep up on the latest news, games and promotions then we recommend you like, tweet and whatever you do on Google+. They accept the usual Credit and Debit Cards, Neteller, Paypal and Paysafe Cards, with approved currencies being GBP, Euro, Australian Dollar and Canadian Dollar. To contact a Bingo Extra representative you can use their live chat option, telephone or email them. They are available 24/7, but if you can’t wait then we recommend checking out their extensive FAQ section. We’re sure your brain is blown by so many amazing bonuses, so why not head over and take advantage of them at Bingo Extra.